What is it? 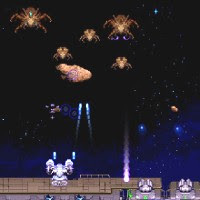 – A-Bot is a late-retro sci-fi shooter, where you control a robot on a deep-space defense platform trying to repel waves of Insectoids – an alien race of bug-like creatures bent on your destruction. Who made it? – The game was created by developers MoRLOCK and Udjin. How does it play? – The game is a lot like a blend of the classic arcade titles Space Invaders and Missile Command. Your mouse controls the A-Bot, a mechanized gun platform that will fire its equipped weapon in a spread determined by your cross-hairs. Enemies float in from the top of the screen in silhouette. Once they completely fade into view, they’ll start attacking (and can be attacked). Move the cross-hairs away from your ship, and the shot-spread widens – and vice-versa. Your turret also moves at a fairly slow pace, and choosing an appropriate shot-spread is important. In addition to your primary turret, you also have to keep tabs on a suite of Plasma Cannons, Energy Silos, and Generators. Plasma Cannons can be toggled to fire automatically, or by manually pressing the spacebar. The silos store your available energy for attacks, and generators generate that energy, so you’ll want to try to protect them as best you can. Cash earned by killing the Insectoids can be used to repair structures and purchase upgrades between waves. Presentation – A-Bot has a retro look that’s decidedly higher resolution than an old school game, but still visually very similar. And maybe it’s because of my old-school gaming inclinations, but the sound effects and computerized sounding voice work are terrific. The explosions could use a little visual punch-up, but it’s a minor quibble. Positives – The shooting is solid, the cross-hair mechanics are interesting and fun, and there’s probably just enough stuff to repair and upgrade to keep you involved. It’ll likely keep you engaged for a while, and the shooting has a somewhat strategic feel to it, largely because of your bot’s slow movement speed and the aiming mechanic. Why you should play it – A-Bot is an adept shooter with some interesting twists that’s likely to appeal to your sense of nostalgia (if you’ve been playing games long enough). Though the term “modern-retro” is a complete oxymoron, it would certainly apply to A-Bot. Shooter fans will find a lot to like; besides, killing space-bugs is fun.